Fellow Nigerians, we are now back to basics after the euphoria and giddiness of the June 12 reactivation and revalidation by President Muhamadu Buhari. If the Nigerian opposition parties had thought it would be easy to defeat the incumbent in next yearâ€™s Presidential election, Iâ€™m appealing to them to re-permutate and re-configure their strategies. 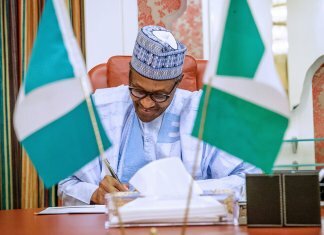 The political masterstroke by President Buhari demonstrated once again that the power of incumbency rests, not only in manipulating the electoral process and the security surrounding that process, but, also in manipulating policies and acts of government to enable the citizenry enjoy the feel good factor that can make them forget the ills and sorrows of the past. Please, permit me to speak authoritatively from my personal experience as a former Presidential candidate in 2011. You will read more about the Nigerian reality in my forthcoming book, authored by my Presidential Campaign Manager, Ohimai Godwin Amaize, the youngest man ever to hold such position in Nigeria, and probably in the world. The book titled, FIGHTING LIONS: THE UNTOLD STORY OF DELE MOMODUâ€™S PRESIDENTIAL CAMPAIGN, is fashioned after THE AUDACITY TO WIN: THE INSIDE STORY AND LESSONS OF BARACK OBAMAâ€™S HISTORIC VICTORY, written by David Plouffe, Campaign Manager, Obama for America. The difference is that Obama won, I lost. Those who laughed scornfully at my epic effort and passed snide remarks about my supposed â€œstupidityâ€ for ever thinking I could win are now among those crying wolf, asserting, with all their youthful vigour, that they are not-too-young-to-run. They said I lacked experience. They actually believed that you must have been a Senator or Governor or both to qualify for their support and vote. Part of that experience should have included stealing sufficient and substantial money from government coffers and blow it on politicians of the same ilk, without principle or ideology. This is neither a joke nor hyperbolic assertion. It is a sound reality. If you think Iâ€™m just blabbing, ask our dear President his experience on the three occasions he lost elections. No one was half as popular. He had perceived integrity in abundance. He was as meek as a Monk. He was ascetic and stern. But he lost to weaker brands. His fortune changed when the deep pockets and carpetbaggers got jazzed up and hypnotised into seeing the born-again democrat in Buhari and fell for the spell. Iâ€™ve gone through this preamble to tell my friends who are in the race the home truth before it is too late. Truth is there are just too many youthful aspirants in the race. For them to make any appreciable showing and impact, they must hold a serious and soul-searching meeting to determine those who stand the best chances among them. They should first narrow down to four maximum, two from the North and two from the South. The four should meet further to delete two from among their number, one from the South and one from the North. Those picked and those de-selected should pledge to work together harmoniously for the good of the nation. Not everybody can be the number one or number two citizen in the country. In picking the candidates, the youngsters shouldÂ endeavour to jettison the zoning nonsense of the two leading and established political parties. This would help destabilise the status quo. A Southern Presidential candidate is likely to create problems for APC and PDP (if PDP still retains that brand) and force the two to scramble for votes largely in the North since both have stuck obstinately to their preposterous zoning rascality. The third force may end up with a Southern candidate in the hope that this candidate can force a grand coalition of all Southern regions in alliance with the North Central. This may be a perfect foil to anything that the major parties then throw up. As remote as it sounds, it may turn out to be the revolution unforetold. The third force should also do the unusual, form a government of National Unity ahead of the elections by creating a shadow cabinet amongst the brilliant and brightest youths from all parts of Nigeria and reach out to those in the diaspora for good measure. Let me confess that this is likely to be a day-dream or pipe-dream. Knowing my people well and their proclivity for egocentricity, none of them would ever agree to hold the meeting that is desired and, even if they do, none would condescend to step down for another. What this portends, therefore, is that Nigeria would be stranded irrevocably and irredeemably with the two big parties, APC and PDP. And where would this leave or lead us? The answer is simple and straightforward. APC has no other way to look but towards the incumbent, President Muhammadu Buhari. This is sure banker unless something akin to an earthquake, volcanic eruption or Tsunami occurs and Baba decides not to run, or is forced by circumstances beyond his control not to run. I refuse to believe the rumours making the rounds that President Buhari is secretly and stylishly shopping for a worthy successor. However, knowing that our country is a nation of rumour-mongering, Iâ€™ve decided to analyse and dismiss or disregard the conspiracy theories. For example it has been suggested that the recent validation of June 12, the seeming recognition and acceptance of Chief MKO Abiola as the undisputed winner of the 1993 elections, the National Honours of GCFR and GCON awarded to him and his running mate, Ambassador Babagana Kingibe respectively, was a cunning strategy and tacit way of bringing back Kingibe into mainstream politics in order to prepare him for a possible baton transfer from President Buhari. 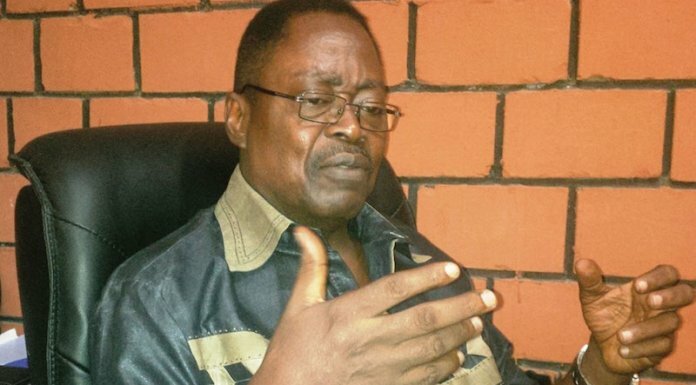 Others have even gone so far as to theorise conspiratorially that the plot is to declare the June 1993 election results and thus ask Kingibe to step in to fulfil the mandate arising from the declaration of those results. This notion is so far-fetched and constitutionally, legally and politically unsound that it can be dealt with as dead on arrival, before it even begins to take root. Checking on Kingibeâ€™s age, we can see that there is no difference really between the two friends. Ambassador Kingibe is already 73 years old, and he will be 74 next year, by the time of our next elections. Despite the Malaysian experience, it is clear that the world has already moved away from the era of retired and tired geriatrics running governments. Science and technology are fast developing and changing pace, accelerating almost at the speed of light, that it would be unkind and unfair on these individuals to ask them to run modern governments and expect them to succeed when they cannot keep abreast with modern trends and ideas. This brings me to the fight to finish between PDP and APC. I repeat, the next President of Nigeria will come from the file and rank of either of these two parties. I do not believe that the third force or ADC or whatever they may choose to call themselves is quite ready to take on the mantle of liberator of the Nigerian masses as yet. However, it is beginning to look like the main opposition party, PDP, is beginning to overstretch its luck. The party is facing a government which seems bereft of ideas and looks willing to forfeit its power to the opposition. Yet, instead of taking advantage of this farcical debacle that the government seems to have conjured for itself, PDP seems to be ready to embark on a journey of self-immolation. Consequently, the discussion and conclusion in town is that Buhari does not seem to have serious opposition as we speak right now. And you canâ€™t blame those who feel that way. By now, most people expect PDP to have realised that it needs to rebrand itself and rid itself of the yoke of the past. That way, it becomes easier for those in the ruling party, who are desperately seeking a move and wanting a way, to do so with some modicum of dignity and respect. We are in almost the same scenario that the opposition to President Jonathan was faced with, prior to the 2015 elections. Those elections were won, not simply because the Government of President Goodluck Jonathan was so bad, which indeed, it was, or because the allure of President Buhari was so great, which indeed, it was not. The election was won because the opposition rebranded and came together as a party of national unity, with the disparate elements from all of the major opposition parties uniting for the good of the nation. Equally as important, as the issue of rebranding, is the failure of PDP to settle, and be seen to be working, for a certain candidate, even if that candidate is not yet formally confirmed. There are too many camps as it were within the ranks of the PDP. Depending on who you ask, there are at least six contenders for the number one slot. They are Atiku Abubakar, Rabiu Kwankwaso, Ibrahim Dankwambo, Sule Lamido, Bukola Saraki, Aminu Tambuwal and Kabiru Tanimu Turaki. Interestingly, three of them, Kwankwaso, Saraki and Tambuwal, are still technically in APC but it is generally believed that their hearts and most of their bodies are no longer in that party. They feel a sense of animosity, antipathy and aversion towards them that is certainly more real than imagined. The result is that this alienation, leading to possible, even, annihilation is such as to make them wounded animals, ready to let rip against a party that they believe they helped to birth and nurture. It is not healthy for PDP that it has not gone through what will be a painful process of picking its candidate, or at least narrowing down its choices, because it means the period for the healing process will be short and possibly insufficient before the elections come. It is certain that there will be a lot of dissatisfaction and disaffection on the part of the losers, because these are strongmen, ironmen in their own individual right. Some will be sore losers. Egos will be bruised. Bad blood will be created. The party must be ready to cope with the fallout, but without time, which is a precious commodity at this moment, it cannot succeed. PDP would require a rock-solid team to dislodge Buhari. That is why it is imperative for the party to take on the two issues of party rebranding and preferred candidate sooner rather than later. Indeed, the right time is now. Once a preferred candidate is known, that person must be ready to play for broke and if necessary commit political suicide. For now, I see only two people with such lion hearts at the moment, out of these seven potential candidates earlier mentioned. These two have been grilled through the ages. Theyâ€™ve experienced the vicissitudes of politics and are still standing by the grace of God or whatever stroke of luck, at least so far. I see Atiku Abubakar and Bukola Saraki in that mould. I do not however rule out others. Both Rabiu Kwankwaso and Ibrahim Dankwambo have displayed some steel and courage in the past. My assessment of them at this stage is because they are simply not household names like Atiku and Saraki, but that is not to say that they cannot yet prove to be the joker in the pack. Dankwambo in particular seems to have done a lot of work in Gombe, as has indeed Tambuwal who because of his relative youth may yet appeal to younger voters. The next election is not going to be as easy to conduct and contest like the 2015 version under President Goodluck Jonathan. The Buhari administration comes with intimidating credentials from a most robust military background. These ones wonâ€™t go down without a fight or guns blazing. Only warriors with stupendous war-chests would stand any chance whatsoever of sacking Buhari and his army of fanatical supporters and acolytes. 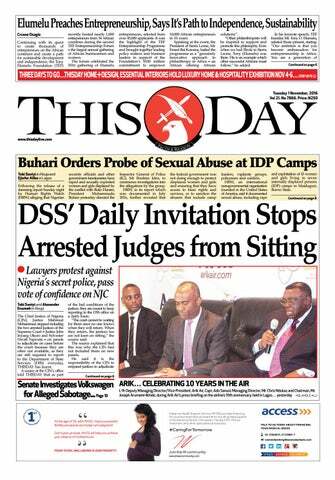 The PDP should make up its mind urgently because time is not anyoneâ€™s friend under this circumstance. I think all the potential candidates should meet as soon as possible with some of the party apparatchik and settle for number one and number two, if ever they hope and pray to dismiss Buhari from power. Time will soon tell!